There exists a strong positive long-run relationship between real GDP per capita and the real value of hydrocarbons production in Latin American and Caribbean (LAC) oil and gas producers. Panel co-integration analysis for the period 1980–2014 suggests that a 100 percent increase in the value of oil and gas production increases the level of GDP by 14 percent on average. The relationship is particularly pronounced in Trinidad and Tobago and Venezuela while for Bolivia it is close to the LAC average. 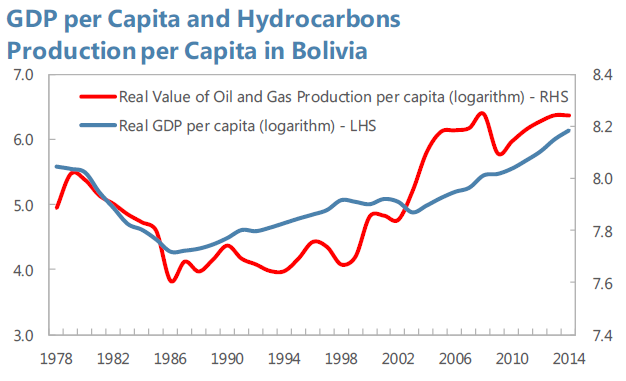 Between 2000 and 2014, the real value of oil and gas production per capita in Bolivia increased by about 370 percent, while real GDP per capita increased by 43 percent. The developments in Bolivia over the recent boom period are thus very close to what one would have expected based on this general relationship. At the provincial level in Bolivia, real GDP per capita in the main gas producing region (Tarija), increased nearly 150 percent during the boom in the 2000s. The huge gas fields discovered in Bolivia in the late 1990s are located in the southern province of Tarija, which now produces about 70 percent of all Bolivian gas. 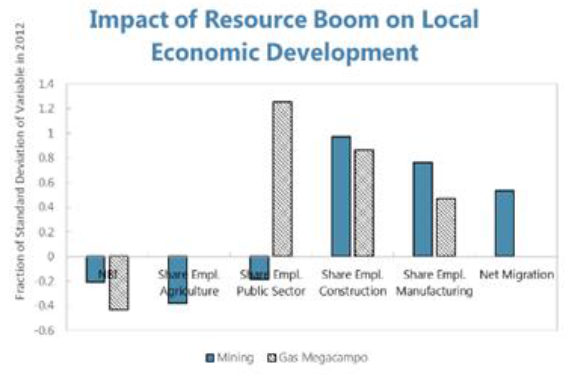 The massive growth in the extractive sector and the related fiscal windfall (with Tarija receiving more revenues than all other 8 provinces combined in 2014) does not seem to have produced important spillovers to other sectors. The only sector besides the oil and gas one which grew substantially more in Tarija than in the rest of Bolivia was construction. The gas boom and associated fiscal windfall reduced poverty in producing municipalities. Data from the 2001 and 2012 population censuses indicates that the large gas discoveries were associated with significant reductions in poverty of around 10 percentage points (as measured by population without access to basic necessities) in directly affected municipalities. Gas producing municipalities also experienced a very large increase in public sector employment (more than 1 standard deviation) as well as important increases in construction and manufacturing employment. In municipalities with mining—which is more labor intensive but generated a smaller fiscal windfall—a larger reallocation of labor away from agriculture, a positive migration effect, but a smaller reduction in poverty was observed. A DSGE model calibrated for Bolivia shows consistent results. The 2 percent increase in potential growth observed during the period 2006–14 (chart) is explained mostly by the commodity price boom increasing profitability in the energy and agricultural sectors, and government revenues. This allowed for more infrastructure investment, improving private sector productivity. The increase in the urban labor supply due to rural to urban migration and the substantial increase in the fraction of skilled individuals in this urban labor force helped the industrial sector to expand and take advantage of the increased private sector productivity. In terms of distributional implications, the increase in the urban labor supply and its average skill level led to higher incomes in urban areas. These factors also reduced the skills premium, accounting for about 1/3 of the observed decline in inequality (chart). In addition, higher agricultural demand and a larger increase in productivity in agriculture (the sector with lower initial average productivity) reduces inter-sectoral inequality with the urban sector. This accounts for another 1/3 of the observed decrease in inequality. Higher government revenues allowed for a substantial expansion in social programs, which account for the remainder of the observed decline in inequality. Model simulations suggest that the bust could reduce mediumterm potential growth by about 1½ percentage points. The forces at play are somewhat symmetric to the boom. First, the direct impact of lower commodity prices accounts for slightly more than half of the expected decline, with the rest explained by a combination of general equilibrium effects. Policies that increase fiscal space to support infrastructure investment and enhance the efficiency of such investment can halve the impact of the bust on growth. Regarding the distributional implications, lower agricultural export prices affect large farmers more than smaller ones, and hence reduces the rural Gini. The urban Gini increases as private sector wages decline more than public sector ones, and civil servants are relatively well paid. The national Gini also rises given the increase in inter-sectoral inequality (chart). The economic slowdown triggered by the bust in energy and commodity prices also lowers incomes across the board. This reduces the pace of poverty reduction. Better targeting cash-transfers can go a long way to mitigate inequality this impact.